Lifeline Advance log finish - clear log home finish. Lifeline Advance is the second component in our exterior wall finish system that includes a limited warranty when used with Lifeline Ultra-2 and Lifeline Ultra-7. Susan G (09/06/2018) - "I have an older log home that was plagued by carpenter bees and these teenie wasps that I was told were aphid wasps. The logs were untreated for more than 30 years and last summer a good friend cleaned, notated, stained with your semi transparent stain and Lifeline Advance Topcoat. We have seen a huge difference in the carpenter bee population. Thank god!!" Jon S (09/04/2018) - "This house hadn't received the maintenance it should have for a long time, it amazed everyone that looked at it as I did the job of cleaning it up using Wood ReNew then ShellGuard RTU. Followed by Lifeline Ultra-7 in Carmel and Lifeline Advance Topcoat, the house looks like it's new." Anjannette A (05/06/2018) - "Was looking for a spot to share my results of your product and wanted to express my satisfaction!! 100% Satisfied Customer!! 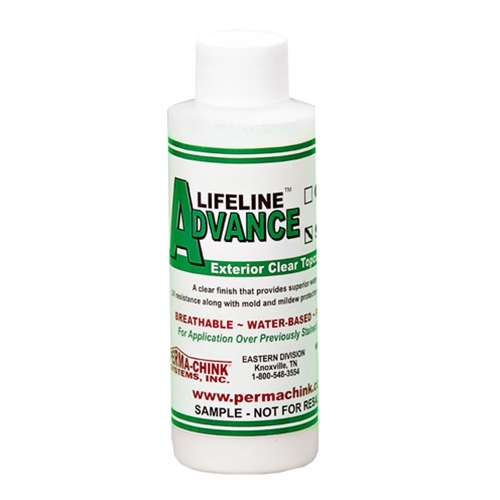 Thank you Perma~Chink for bringing my Cabin back to life with Lifeline Advance." Rick P (06/21/2017) - "Just wanted to thank you for your great personal customer service and for the outstanding products that Perma-Chink offers, they are without a doubt the highest level of quality that I have ever used on my log home......Thank You to ALL of the Perma-Chink people for your excellent products and excellent customer service." Sondra G in KY (10/30/2016) - "We used Ultra-2 (Bronze) and the Advance (Gloss) in 2011, and it still looks as good as it did in 2011! We do wash every year with the Log Wash. Perma-Chink always goes above and beyond to help the customer." D Immell (03/25/2016) - "I have used this clear top coat on my home since I purchased our log home in New Mexico. I chose to go with the gloss topcoat, the protection it provides against the outdoor elements is amazing. My home looks amazing after 3 yrs of having your product on it. Thrilled with the quality of your products. Thanks"
T Steel in ND (05/30/2015) - "So glad I used the Advance. It helped reduce the maintenance on my home. I have more time enjoying my log home! A Neuman in WI (05/2/2015) - "I couldn't believe the coverage I got using the Lifeline product especially the Lifeline Advance top coat! J & C Enck in KY (02/21/15) - "The Ultra-2 it went on easy and the second coat made some blotchy areas even out, making them look great. The Advance (Gloss) top coat made it look even better!" 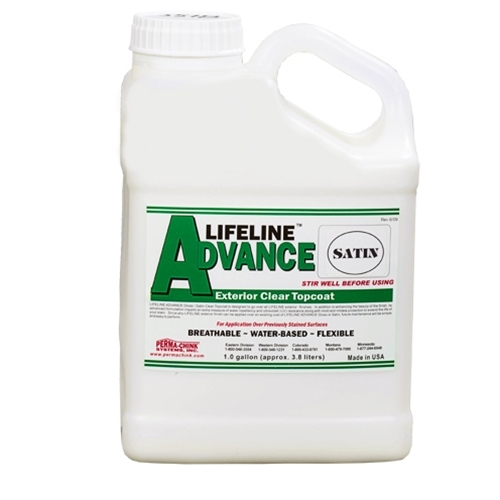 A Swick in NC (07/13/14) - "We just put a maintenance coat of Lifeline Advance on and I want to keep it up so I'm buying some Log Wash today. So far your products have been the best that we've put on our home." T Thibodeau in LA (11/22/2010) - "Advance added a great finished look to my home. Went a long way and was easy to apply."